← Ask a Real Live Agent Your Question About Query Letters! I went to the Cindy Sherman exhibit at the Museum of Modern Art last week. It was truly fabulous. If you’re a writer and you don’t know who she is or about her work, I strongly urge you to check her out. As a writer myself, and as someone who edits and represents others’ writing, I find Cindy Sherman’s body of work fascinating, inspiring and even instructive. I think that one of the challenges in creating believable characters, dialogue and voice in writing is not only to choose the right words, so to say, but also to achieve authenticity. My Mac-tionary/Macthaurus thingy that looks up words for me on my laptop says that authenticity means “of undisputed origin; genuine.” So when building characters and crafting the words that come out of their mouths, usually the idea is for them to be three dimensional, to be undisputedly who we are creating them to be. To be authentic. For over 30 years Cindy Sherman has been photographing herself, posed, styled and dressed as types and characters of people. One of the things that makes her work brilliant, I think, is that she manages to climb inside her subject and is then able to project something out to the viewer, while simultaneously being the photographer and having the ability to capture that something. As writers, we kind of have the same task. We need to be able to climb inside each of the characters we are creating, and then have them speak their words, take their actions, be part of a story. And I think a good writer doesn’t merely do this only for the main character. When we craft our characters from the outside, looking in, they just don’t read as authentic. What Cindy Sherman achieves in her work, because she is both photographer/stylist and model, is to highlight that discrepancy between who a character thinks they are and who and what we, as the lookers, actually see. When you build a character or write dialogue, rather than writing it how you might hear it, try writing it how you might say it. Climb inside them to perform their actions. Then, after you’ve written, have someone read it to you and then listen. I think a shift in perspective like this is invaluable. It is inhabiting your characters. It is being the photographed and the photographer. All of the above photographs are by and of Cindy Sherman, in the current MOMA exhibit which runs until June 11, 2012. Oh, this exhibit looks amazing! I’m so glad I’m coming to New York in April. I will definitely check it out! The suggestion to have someone else read our work to us is a great one. Not sure I know who would read my entire novel to me (yes, I have read my entire novel aloud – more than once), but that would definitely be an experience. Wow, I am amazed by these photos. If you hadn’t told us these were all the same person I never would have known. Absolutely fantastic. That exhibit sounds so inspiring, Linda. When I’m building new characters, I often Google for images that sort of look like the person I see in my head — usually non-famous people I find by searching terms such as “obese, female, cat sweater” or whatever. Then I’ll print off the image and tack it up near my desk. Kind of weird, but it helps me bring my characters to life. Why do I just KNOW you’d particularly enjoy it? The exhibit is here until June, so if you have any plans to come down to NY (or if you want to make plans!) I highly recommend it. Obese, female, cat sweater indeed! I write a lot, and after a while, I stop thinking about how I do it. I just sit down at the keyboard and write. It’s like brushing teeth. I can’t tell you how I do it, but I’m pretty sure it’s the same way every time. Thanks for the reminder that changing perspective is vital to staying fresh and learning new ways of saying things. Not ready to have someone read my work to me, though. I am my own toughest critic. Having someone read your work to you is not for them to critique it. It’s an exercise for you to hear it in a different way, an opportunity for you to step out of the box of writer and become a listener of your own work. 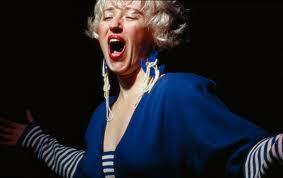 You’re so right about Cindy Sherman being a perfect example for us. Thanks! 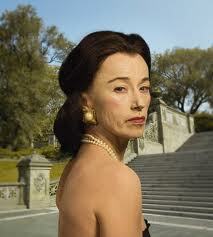 I learned about Cindy Sherman in art school but have never seen her work in person. I’d like to someday because I think she’s pretty amazing and I wasn’t aware she worked in such large scale. If i didn’t think that everything happens for a reason I’d say I should have been born in NY; never been to the Met or MOMA. Thanks for the tips and using CS as a guide makes sense to me especially with an art background. Excellent advice. I think dialogue is an area where we who write, should spend more time. Excellent advice. And easier said than done. I think all of it is easier said than done! A character’s voice is important. I have found that reading it aloud is the best way to hear the voice as well as seeing the character’s body language. Phenomenal exhibit. I knew her work, a little bit (more like “about” her work) but seeing an extensive exhibit of it was particularly impressive. It really got me to thinking about character and representation in a way that seeing a few of her photographs never have. And some of those photographs were HUGE! I love New York and I love MOMA so it makes me want to hop on a plane tomorrow! I never heard of her but will look more into her work. The photos on your blog were intense.